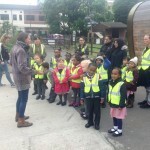 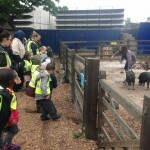 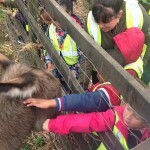 On Thursday 4th May Shoreditch and Haggerston classes took the train to Shadwell, then rode a bus over to Stepney City Farm. 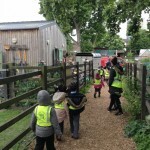 It was our first time taking the Overground as a class and we loved watching the buildings fly past as we left Hackney and pulled into Tower Hamlets. 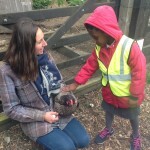 We met Alex, a farmer at the farm. 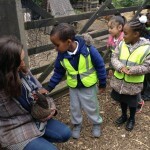 She gave us a tour, showing us the different animals at the farm and teaching us about them. 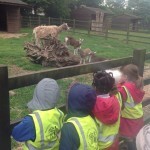 We saw lots of jumping goats and their kids, as well as some very shy little lambs who didn’t want to stray far from the mummy sheep. 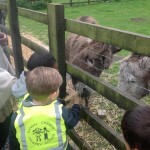 We loved seeing the two donkey brothers, George and Dunstan. 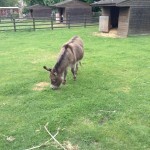 They liked to roll in dust and we fed them hay and stroked them gently. 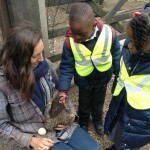 We also stroked chickens and touched a freshly laid egg- it was still warm! 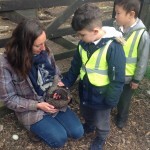 Did you know that different chickens lay different coloured and sized eggs? 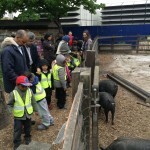 Next we moved on to the pigs and watched them gobble down an raw egg. 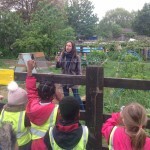 We also learnt about the herbs and vegetables they grow at the farm like onion, garlic and mint! 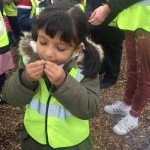 We got to smell the fresh plants and had to guess what they were. 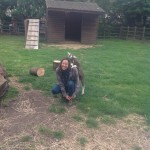 Inside the barn we saw were the poorly animals go- to the sick bay! 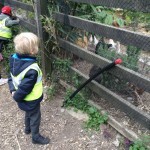 A quick peek at the guinea pigs and rabbits and it was time for us to go. 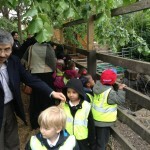 We washed our hands carefully then off we went, back to school!